The ultimate physique presentation and total muscular definition posing oil that will leave your competition in the pump-up room. Formulated exclusively for hot lights Muscle Juice shows your true muscle definition without creating blind spots. Mu scle Juice allows your skin to breathe limiting perspiration beading while the natural oils soak into your skin to moisturize the gradually emerge to provide a superior sheen. Soybean Oil (Glycine Soja) Corn Oil (Zea Mays) Almond Oil (Purnus Amygdalus Dulcis) Fragrance Tocopherol Acetate (Vitamin E). Spray directly over entire body then massage over skin. Be sure not to get any on posing suit. Reapply for added sheen. 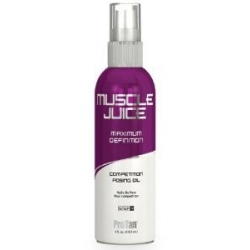 Contest Tip: Judges and spectators prefer Muscle Juice Professional Posing Oil for the night show due to the glossy sheen effects. For external use only. Avoid contact with eyes. Discontinue use if irritation occurs. * These statements have not been evaluated by the Food and Drug Administration. This product is not intended to diagnose treat cure or prevent any disease.